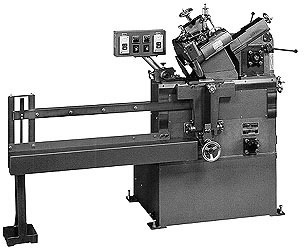 Only the GL-250H can maintain and sharpen band saw blades with KV configured tooth patterns. The wider gullets of the KV tooth design provide a smooth sawdust discharge. The other KV design features reduce the vibration on the top of the teeth. This significantly improves the productivity and the quality of the cut surface. The GL-250H can be set up for resharpening the KV tooth configuration or either of the straight or round back shaped teeth. You will find this to be a user-friendly, functional and precise band saw resharpener.